After a fantastic weekend in Charleston, I am back in New York but have to share all of my foodie adventures! 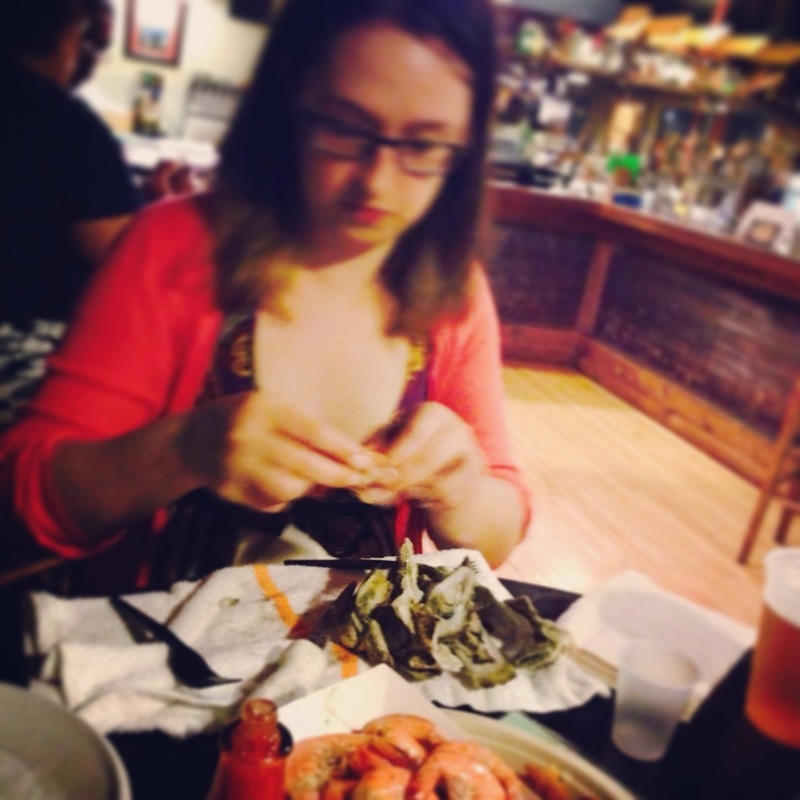 In addition to soul/low country food, seafood is another specialty. I had a lot of fun Friday night venturing out to Bowen Island (yes, an actually marshy island) near downtown Charleston. What used to be a little shack near the water is now a formidable two story wooden shack. I wish had gotten a picture of the “oyster bar” area downstairs but that was basically plywood tables with holes in the middle (for your oyster shells) and little else. 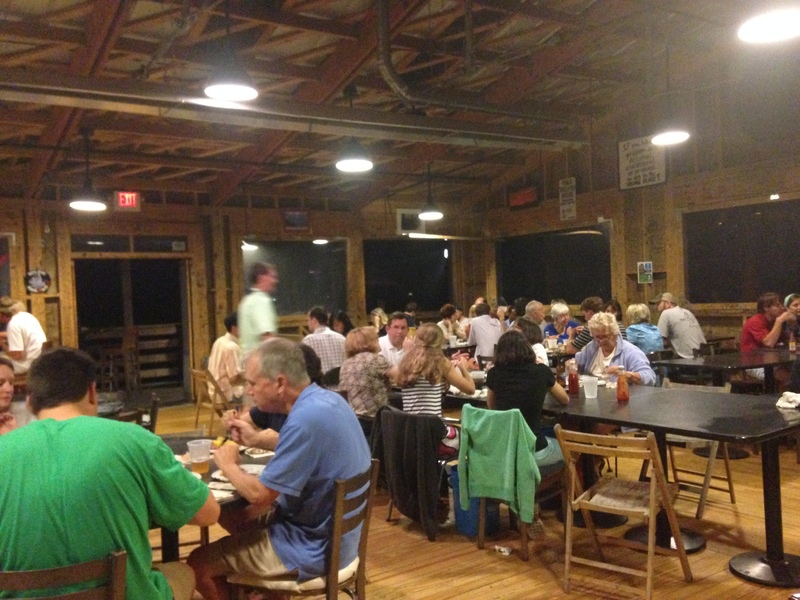 Upstairs, long tables line the wooden hall. You order from the bar, very little frills here. The best deal is the oyster plate, which is a entire tray of boiled oysters. There is also an all-you-can eat option for the very hungry or those feeling challenge. 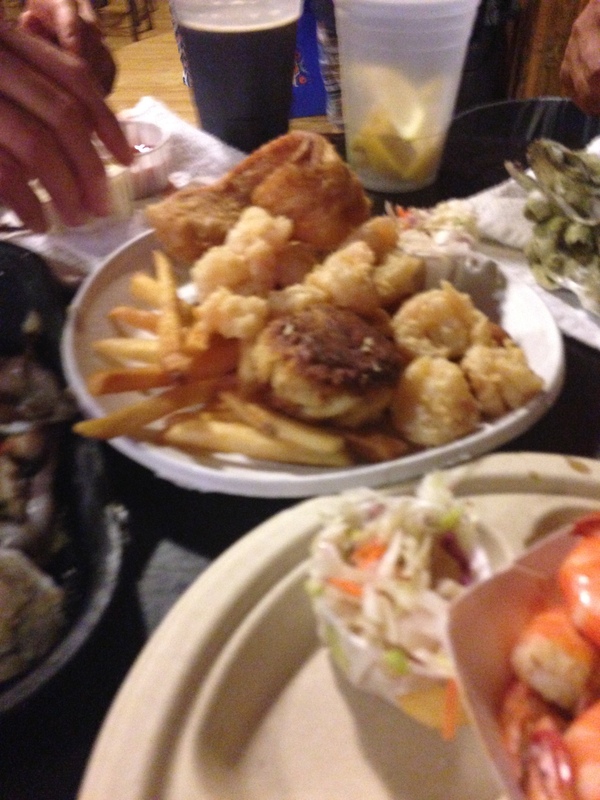 Other food option included a variety of fried and fresh seafood. All of the beers on tap were local brews, and the bartender was very knowledgeable about them, asking what brands we would normally pick to find the best beer. I went with a hoppy IPA. Here is the oyster tray! 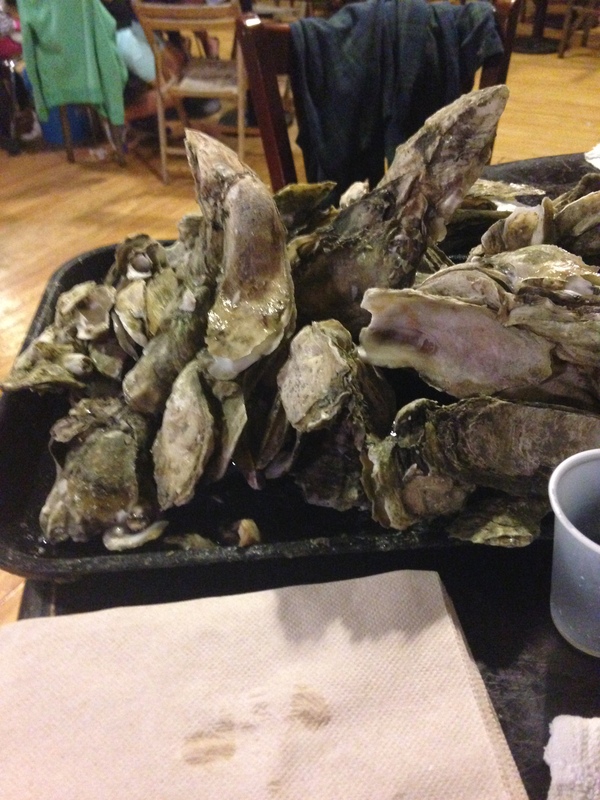 To pick it up, you go downstairs to the oyster bar area, and they are boiled up right in front of you. I had never had boiled oysters before, only baked or raw on the half-shell. I will have to say that this way is not only more fun, but I thought it tastes even better. They proved a shucking knife, and you open them yourself. Here is the first oyster I opened! I didn’t realize that they come in clusters with multiple oysters. I though the taste was almost sweet and absolutely delicious. No meal is complete without hush puppies and French fries. We also ordered the boiled shrimp. I think it was maybe boiled in beer or at least very nicely seasoned. It great flavor to it. Here is our plate of fried fish (and more French fries). 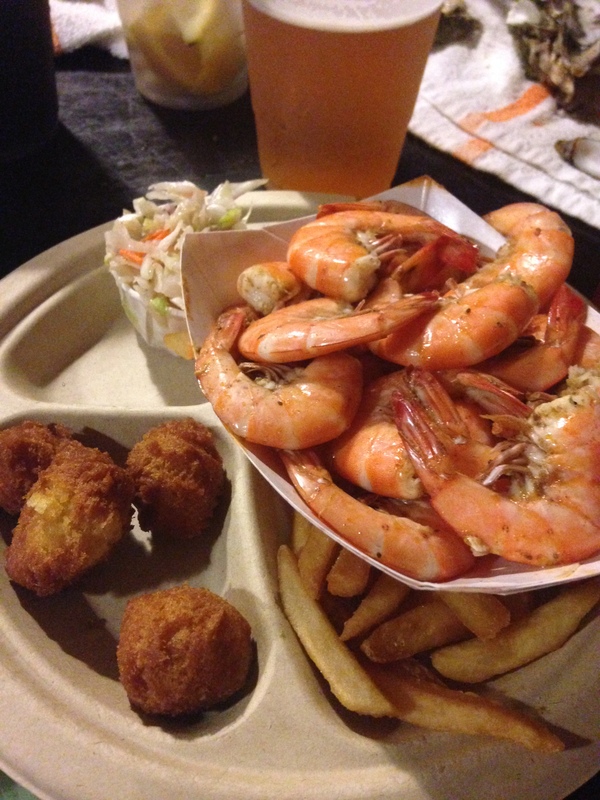 I actually liked the fried shrimp, it felt more lightly battered. Also a side of slaw to get our veggies (and mayo) requirement. Lastly, an action shot of me hard at work to get my dinner. The place was a bit funky, my elbows were sticking to the table. 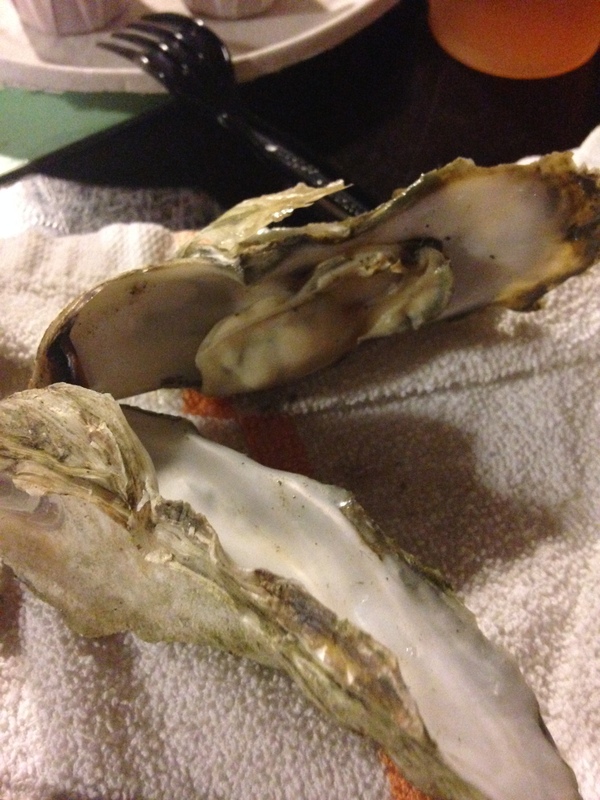 Regardless, it was so much fun to shuck my own oysters. I will be going back the next time I visit. However, we didn’t get there until almost closing time. I would highly recommend going around sunset time and enjoying a few beers along with your oysters. I don’t know if I would try the all you can eat, but it would certainty be fun to see someone else try!